ETS Emergency Solution for Plants & Gardening: 8 Foot Kale?! (12) - Perelandra Ltd. I have tried many years to grow kale in my garden with only mediocre-to-failed results because of heat, drought, insects, etc. Last year I tried ETS Plus for Plants on my kale plants in earnest. I sprayed them often especially while they were young and tender. Also I sprayed them during severe heat spells and when the kale bugs descended. I told everyone that my kale was as tall as I am, which is 4'8". They usually didn't believe me. In the fall due to abundant rainfall the plants were so gorgeous and healthy. I left them right where they were and kept on picking them until December. In January, after a major snow of over a foot deep, I went down and harvested an extra large batch, scraped the snow off the top and picked the wonderful green leaves. (Kale gets sweeter after it frosts.) After the extremely cold spell with strong winds later in January, I saw that they were both frozen and dried (natural freeze drying! ), so I ceased picking. This spring was one of the wettest on record and I didn't try going into my garden which was on low ground and covered with large puddles. But when Easter was over and the sun shone forth again, I went to check things out. I really couldn't believe the stalks of kale and collards that I saw lying on the ground, many still green. My husband pointed out one in particular which had formed a circle, saying, "that stem is 6 feet long." I wanted to check, and I measured three times to be sure I wasn't imagining it. The stalk of that kale plant is 8 feet 9 inches. Holy mackerel! That is what happens when you use ETS Plus for Plants. I have never seen anything like it. I took pictures to prove it. Also, less than half of last year's brassica plants died during the extreme cold and the blizzard of 2010. So I'm picking the sweet young tender leaves that are popping out with the buds for a new generation of seeds. I thought I should write home to Machaelle and all about those kale plants. 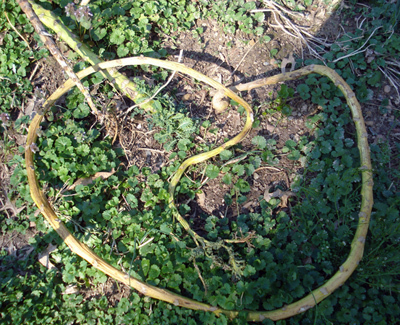 There were quite a few stems measuring in at 5 feet. Awesome!